I love new books – the smell of fresh pages, the pleasure of opening that first untouched page, an uncreased spine, a clean front cover. But I also love second hand books. There’s something about holding and reading a book that so many other people have held in their hands, the smell of old books, the folded down pages, the creased and tattered spines, the handwritten notes on the front pages. One great place to find second hand books is charity shops. It wasn’t until recently that I realised how well stocked they often are and how you can buy quite a few books for relatively little. On my lunch break a few days ago, I visited the local dedicated music and book Oxfam store. I could have so easily spent a good while in there – it was really well stocked, with shelves upon shelves of books of all categories, from literary fiction and crime fiction to non fiction books on history and photography. Even though I had a limited amount of time to spare, I still managed to give 3 books a new home, and I’m certain that there are more treasures to be found on future visits. That’s another great thing about charity shops – there are always new donations so you can find a new favourite book with every visit. I’ve read Remains of the Day and Never Let Me Go, both of which I really enjoyed, so I was pleased to spot this title on the shelves. Set in England in the 1930s, the novel follows Christopher Banks, a celebrated detective. Despite his success, he is haunted by one unsolved case – the disappearance of his parents in Old Shanghai when he was a young child. I’m really looking forward to starting this novel. The blurb describes it as a “story of memory, intrigue and the need to return”, which made me certain I was going to buy it. 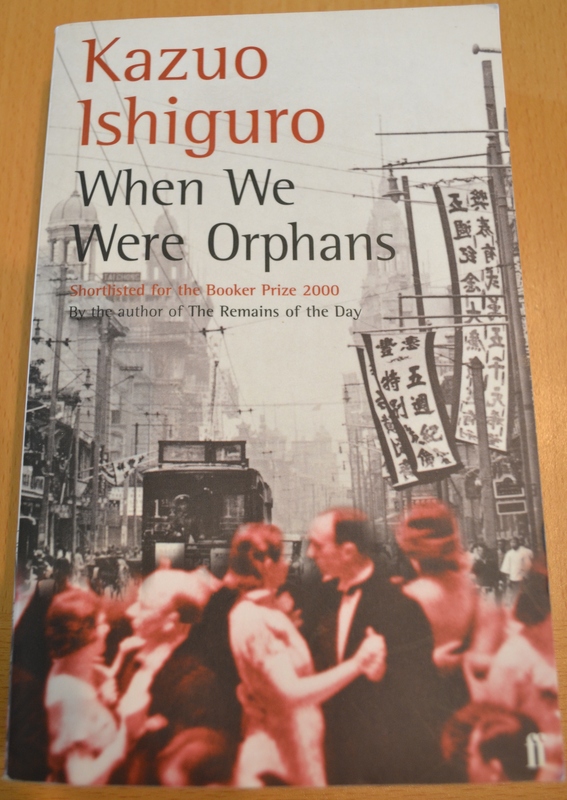 I’ve enjoyed Ishiguro’s previous work, with other titles on my To Be Read list, so I’ve got high expectations. This novel has been on my TBR list for some time now, and when I saw it on the shelves I knew I had to buy it. Set in a suburb of London, Greene’s novel tells the account of an affair. According to the blurb, the story follows the steps taken by a writer to “detroy – or perhaps to reclaim” the mistress who left him. Greene is a writer I’ve heard a lot about, but have unfortunately never read any of his work, so I’m looking forward to reading this one. I have to admit, I didn’t buy this book to read but I just couldn’t leave it behind. I already have a copy of this book as I had to read it for one of my University modules last year, and I loved it – I even wrote one of my final essays on the novel. The charity shop had an entire shelf dedicated to books with the original orange and white Penguin covers and seeing them all lined up together made me want to buy them all so they wouldn’t be seperated (does anyone else ever feel like that?) 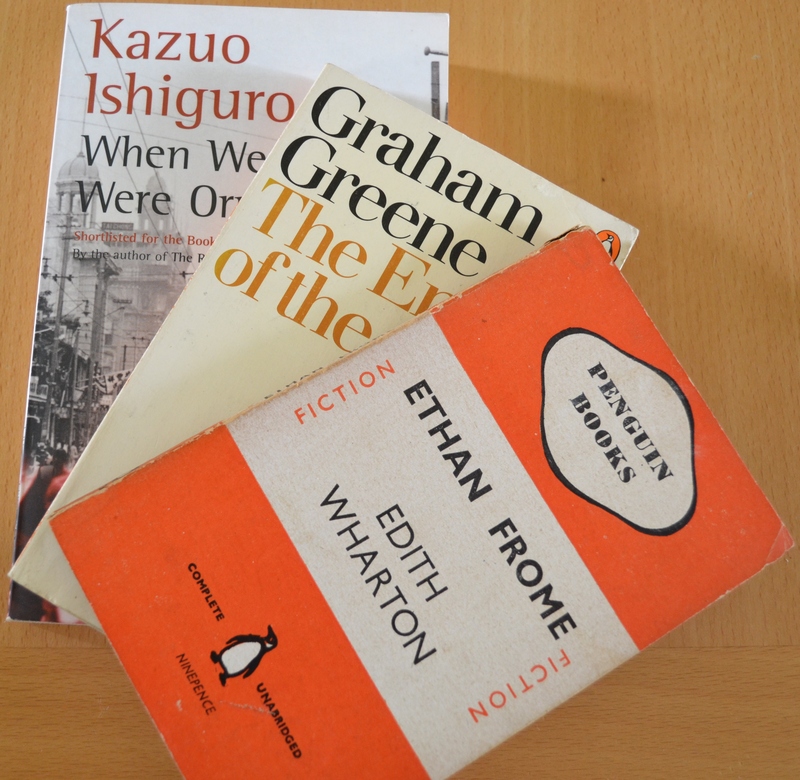 but I decided to choose Ethan Frome because I knew that I loved the book. I have the 1944 edition and, aside from the novella itself, I love the adverts on the back cover and first page – it feels like holding a piece of history in my hands. The novel tells the story of Ethan Frome who lives in the desolate and bleak Starkfield. Merely surviving off the land, the arrival of Mattie, his wife’s cousin, makes him realise that there’s more to simply existing. It’s a beautifully written and moving novella. These three books came to under £7 so I was really pleased. Yes, they might not be the newest releases and in pristine condition, but I think the fact that they’re not makes them a bit more special. Have you been charity shopping recently? Did you buy any books? Hope you enjoy your books, I will try to seek out the last one as you said it was good. I love picking up charity shop books!. The ones you picked up all look really good. I’m definitely going to have to have a rummage through my local charity shop this weekend now, you’ve gotten me all excited!